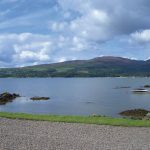 Sandgreen Caravan Park, located near the small town of Gatehouse of Fleet in South West Scotland, lies within one of Dumfries and Galloway’s National Scenic Areas. 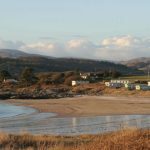 Boasting some of the most spectacular scenery Scotland has to offer, the Park slopes gently down to its very own private beach. A truly unique holiday destination, Sandgreen offers a haven for those in search of a secluded getaway. Not many holiday parks lay claim to its own stretch of coastline, yet Sandgreen is an exception. 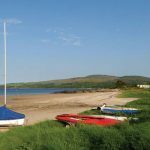 Overlooking the Fleet Bay, the Park affords visitors fantastic views of the dramatic Galloway Hills to the North, the Murray Isles and on a clear day, the Isle of Man. Life at Sandgreen revolves around its seaside setting. Hidden rock pools provide a natural playground for children of all ages, while water sports enthusiasts can indulge in a spot of sailing, water skiing or windsurfing. With shallow waters, the beach at Sandgreen is one of just a few locations in the region from which you can launch your boat; a benefit valued by a number of the Park’s existing lodge owners, who keep their boats, dinghies and canoes in the storage available on-site. Situated in a National Scenic Area, Sandgreen’s unspoilt landscape is the first breathtaking feature you notice when approaching the Park. Presented with a Gold Award as part of the David Bellamy Conservation Award Scheme for the sixth consecutive year, Sandgreen’s natural environment offers a home to an abundance of wildlife, which peacefully occupies the surroundings. 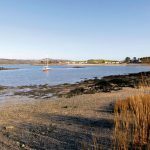 Once at the Park, many find reason not to leave the idyllic setting, yet those that are looking for a distraction from the quiet haven can visit the beautiful harbour town of Kirkcudbright, which is only a 10 minute drive away. 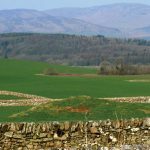 The market towns of Castle Douglas and Dumfries, which are steeped in history, offer speciality shopping to satisfy the most discerning shopper. While the contemporary cities of Carlisle, Edinburgh, Newcastle and Glasgow are all less than 120 miles away. 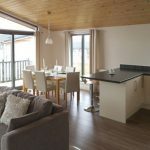 Complementing Sandgreen’s stunning backdrop, are a number of luxury leisure lodges, ideal for those looking to enjoy peaceful and relaxing holidays from a base of their own. 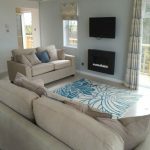 Including TWO luxury lodges “For Sale” for this season. 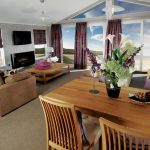 The Pathfinder Thorverton Lodge and Island Leisure Glen Clova Lodge offer unrivalled beach side locations giving stunning views over Fleet Bay. Each lodge has many top of the range internal fixtures and fittings to fully compliment the quality natural wood exteriors. 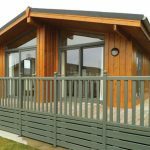 The lodges also come complete with extensive decking areas which feature glass panelling to further enhance the views and outside living. Wessex’s Contemporary model is also ideally suited to Sandgreen. With an expanse of glass in the main living area, natural light floods in showcasing the Park’s stunning vistas. With vaulted ceilings, exposed beams and rustic hearth with wood burner-style fire, Wessex’s Classic lodge ensures that no matter what time of year you choose to escape to Sandgreen, you have a cosy and snug lodge in which to while away the hours. 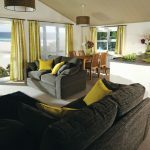 With understated charm, both Wessex lodges offer a sanctuary in which to relax and watch the sun set over the Park’s beach and dramatic coastline.